Creating new software has low overhead: All you need is a keyboard and patience. Heck, you can even grab hunks of ready-made code from open-source libraries. But creating hardware is a lot, um, harder. At best, it’s a tedious process of soldering parts together. But often it’s plain impossible. 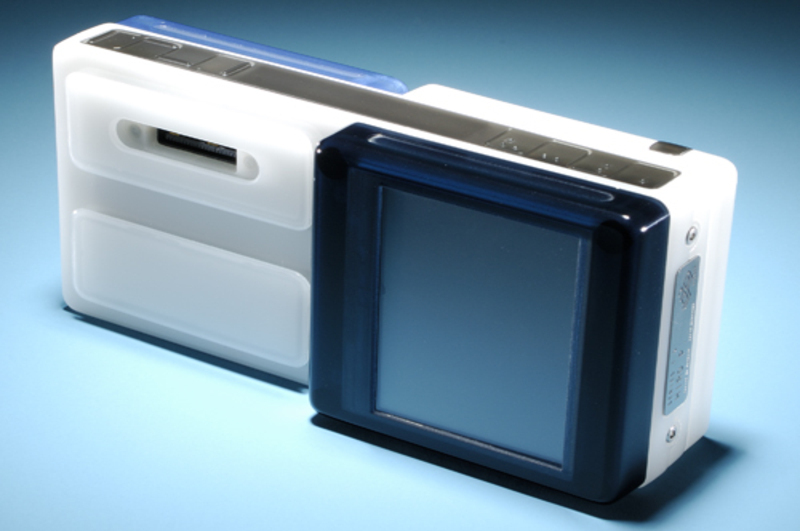 Sharp may have a great miniature LCD panel you want to use. And they’ll be happy to sell it to you, as long as you buy 999,999 others along with it. Bug Labs is tying to make hardware hacking nearly as easy as code mashing with its Bug platform: A series of components that snap together like Legos to form new gadgets. They announced their plans months ago and have shown renderings of the components, but today they took the wraps off the actual pieces. We saw them, and took pictures, a few weeks ago while working on an article for our upcoming January issue. Key impression: The stuff is really small. Initially, I’d pictured a large, unwieldy, Rube-Goldbergian contraption. But this stuff is svelte. 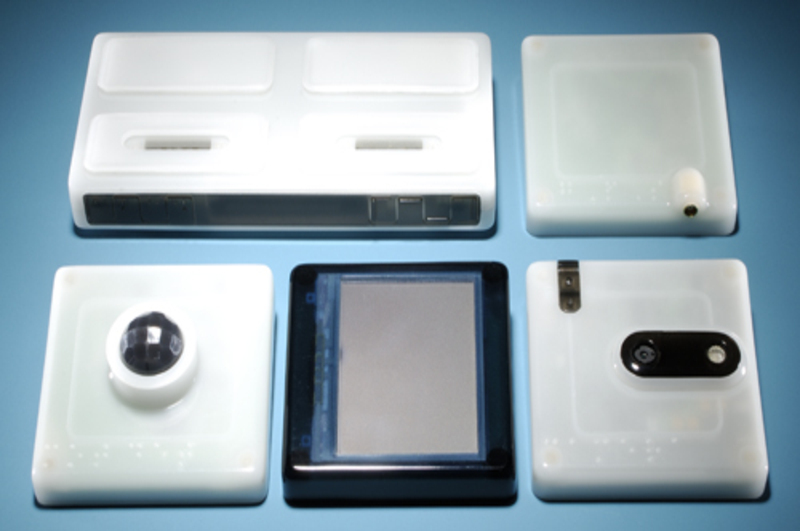 The Bug Base – a Linux computer that forms the heart of any gadget (top left in this photo) -- is a trim 5 x 2.5 x 0.6 inches. Not quite as small as an iPhone, but not much bigger. And the modules are a tiny 2.5 inches square by a quarter inch thick. Four modules (enough to fill every socket on the base) will be available when the product debuts before the end of the year: A GPS receiver -- next to the base in the photo above -- and, from bottom left to right, -- a motion sensor, a touch-sensitive LCD screen and a camera. Bug labs hopes to release four new modules per season -- if they can score the parts. Peter Semmelhack, Bug’s founder, said that it’s very difficult to get component makers to sell them parts in smaller-than-typical quantities (a few hundred or thousand vs. hundreds of thousands). To get a mini LCD panel, for example, he had to convince the maker to buy into the overall idea of Bug Labs and do the sale out of the goodness of its corporate heart. The struggle continues. Wi-Fi is supposed to be included in the Bug Base, but as of a few weeks ago, Semmelhack was still looking for a supplier. Not sure my IT manager would agree about software having a low overhead. Last proejct was 5 mill, 2 years and nothing to show. Well, this Bug Labs debuts DIY Gadget-Building Kit was so cool. I am sure many will get interested with this new invention. I enjoyed reading this post. Thanks for sharing. The buildings are works of arts because they are part of the creation of ingenuity of man. The new designs that catch the attention of many by the structure, colour, and size. It´s amazing the talent that man has developed over time to build. I have been reading about it because I want to change this things in my house, I think that these products look so elegant!I'm so envious! And you look fab!